Evo & Grace: The WanderLusts: A Moving And Mesmirizing Sister Act. Ovation Productions ventured into Broadway musical for the very first time when they brought Disney's Beauty and the Beast in 2015 to which I had the privilege of catching at the Cultural Center Of The Philippines. And the Philippines is lucky enough to be included in the 2017 International Touring Production of Sister Act before moving to China. This gloriously Broadway musical was adapted from the 1990 hit movie of the same title to stage, in California on 2006 before it opened in West End on 2009 and then later had its Broadway premiere on 2011. Produced by Whoopi Goldberg, TROIKA Entertainment and Sister Act On Tour LLC, this marked Ovations' second musical engagement. Set in 1978, the story revolves on the life of Deloris Van Cartier a powerhouse disco diva who was forced to hide in the convent after witnessing a murder committed by her boyfriend Curtis Jackson who owned the club where her group performs. Whatever life happened to Deloris between Mother Superior and the rest of the nuns is something, a must for the audience to see. This was the first musical that I knew nothing about except that I knew that it was adapted from screen to stage. The act of this musical was seriously electrifying and thrilling. From symmetrical to asymmetrical blocking and balance, the metallic-glittering costume and the beautiful and painstakingly painted huge backdrop created a magnificent and reminiscent illusion and illumination onstage when projected with the magic of lights. 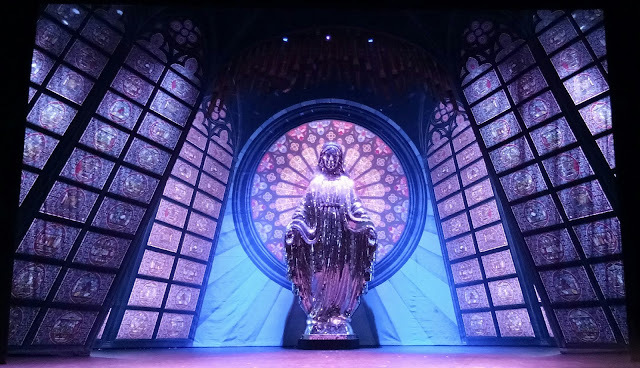 A 16 foot statue of Virgin Mary is a signature masterpiece of the set which the stage manager said it travels as one huge piece. It didn't come to me that the music will be a surprise at all especially if it was written by the award winning composer Alan Menken. The singing, swaying and swinging of these actors were all convincing. In fact, there were no dull moments whether a solo, duo, trio, quartet and the entire cast performance, I've been wanting for more indeed. Another highlights on the show are the musical soliloquies but my favorites are "Here Within These Walls" and "The Life I Never Had" because it was so touching and overwhelming. The 11 o'clock number song "Sister Act" is another soothing performance of the night. 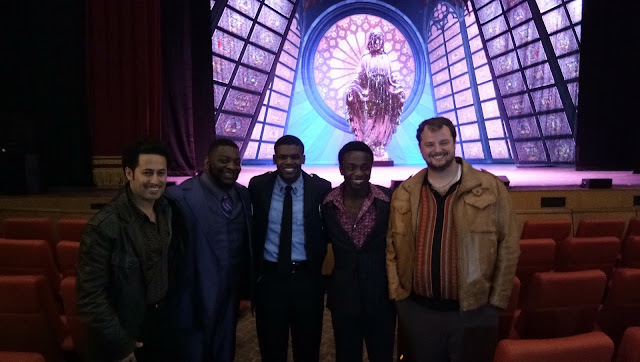 I can't help myself to make a comparison and contrast in some musicals that I saw like the trio number of the African-American Motown singers doing the opening scene in Dreamgirls and who can forget the nuns singing, " How Do You Solve A Problem Like Maria? " in the hills of The Sound Of Music? There were scenes in Sister Act that reminded me the characters and themes from both Dreamgirls and The Sound Of Music, evidently noticeable. 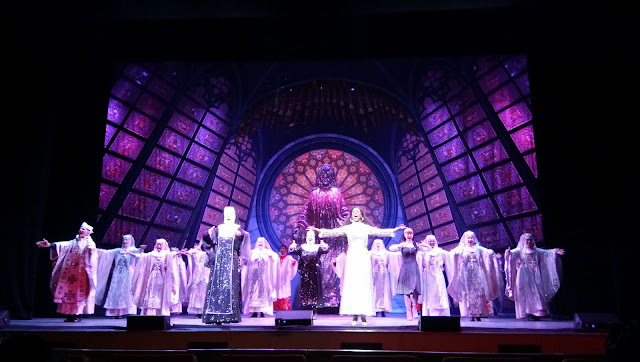 I did not find it intriguing at all because I seriously liked what I saw in watching #SisterActInManila.